The departing chief executive of British Airways and the head of Legal & General are among the businessmen to be honoured by the Queen. BA's Rod Eddington has been given a knighthood in the Birthday Honours list for services to civil aviation. David Prosser, L&G's group chief executive, is being knighted for his work in the insurance industry. O2 chairman David Arculus and Design Council boss George Cox are also set to receive knighthoods for their work. Callum McCarthy, chairman of the Financial Services Authority (FSA), gains a knighthood for services to the finance sector. Rod Eddington was born in Perth, Western Australia in 1950. Educated in his native country and at Oxford University, Mr Eddington joined the Swire Group in 1979, working for its subsidiary airline Cathay Pacific where he became managing director in 1992. His career journey in the airline industry continued when he was appointed chairman of another airline, Ansett Australia, in 1997, before replacing former chief Bob Ayling at BA in 2000. Cost-cutting programmes followed at the flag carrier following a loss of £200m in 2002 as the global airline industry struggled to recover from the effects of the September 11 terrorist attacks. By 2003, the airline, under Rod Eddington's leadership, had bounced back to record a profit of £135m against the background of the Iraq War and the Sars outbreak. He described his knighthood as "a wonderful way" to round off his career in the aviation industry. Legal & General's David Prosser has been with the insurer since 1988 and is now its chief executive. He has also held positions at British Coal - where he was chief executive of CIN (the pensions investment management company) - at rival insurer Sun Alliance and at stockbroker Hoare Govett. Mr Prosser is currently non-executive director of the Intercontinental Hotels Group. He is also a fellow of the Institute of Actuaries and holds a degree from the University College of Wales, Aberystwyth. David Arculus joined the board of mobile phone giant O2 in 2003 and became chairman in the following year. Mr Arculus is also chairman of the Better Regulation Task Force and a non-executive director of Barclays. The Better Regulation Task Force was created to advise the government on ways to improve the effectiveness and credibility of its regulation. He has also served as non-executive chairman of water utility Severn Trent and was non-executive director of Geest and Oxford University Press. He used to be chairman of IPC Group and before that was managing director of publisher Emap. George Cox has had a varied career. He started out as an aeronautical engineer and by the time he was in his late twenties, he had spent two years running a factory. In his corporate life, he managed Unisys UK before becoming chairman of the company. In his entrepreneurial life, Mr Cox formed the IT consulting and research company Butler Cox in 1977, which was floated on the stock exchange before being sold off to Computer Sciences in 1991. He took on the role of director general of the Institute of Directors (IoD) in 1999 and helped launch new IoD premises in seven other cities, including its first overseas site in Paris. He was senior independent director of Liffe until 2002, playing a major part in overseeing the restructuring and turnaround of the exchange. An economist and graduate of the School of Business at Stanford University, Callum McCarthy spent his early career in the chemical industry and the Department of Trade and Industry (DTI), where he held several posts including Principal Private Secretary to both Roy Hattersley and Norman Tebbit. Leaving the DTI in 1985, Mr McCarthy joined Kleinwort Benson as director of corporate finance and then in 1989 joined Barclays bank. He eventually headed the bank's businesses in North America. His next job was as director general of gas regulator Ofgas. When the energy super-regulator Ofgem was created, he soon became its chairman, overseeing the introduction of wider competition in the gas and electricity markets. 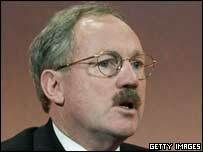 Mr McCarthy joined City watchdog, the Financial Services Authority (FSA), in September 2003 as acting chief executive.